"DC meets Manhattan in this direct river view 5-Star offering"
Designed by the celebrated architectural firm of Pei Cobb Freed & Partners, the Waterview is world class living at its finest. 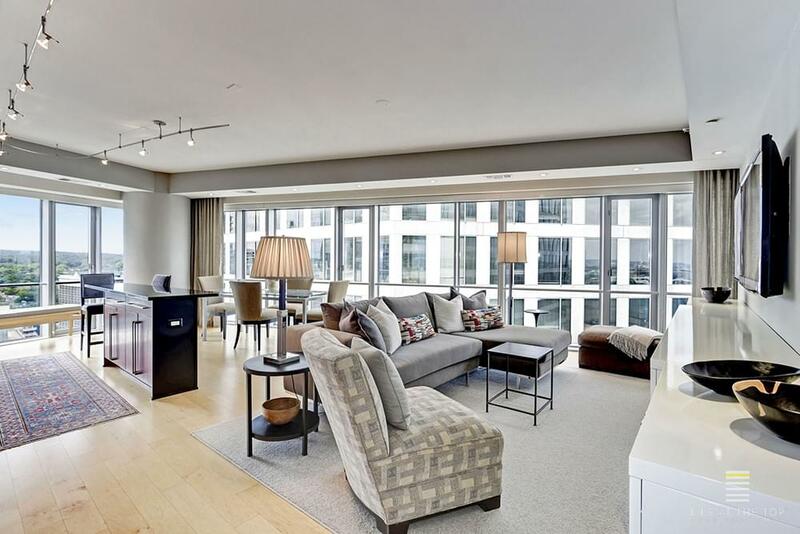 26 Floors above Rosslyn, floor-to-ceiling walls of glass with direct Potomac views leave no doubt why this corner "A-Line" Unit is the most sought-after and sometimes fought-over exposure in the Waterview. The corner location reveals two wonderful exposures that make this the preferred side by residents. An open kitchen with custom Wood-Mode cabinetry, granite counters and Viking, SubZero, Miele and Dacor stainless steel appliances will make the gourmet in you happy while keeping you at the center of things. Sleek built-in furniture, custom lighting and finishes grace the entire apartment adding function and style. The master bedroom and bath include designer built-in cabinetry that provide floating wall-mounted storage. Abundant closet space, and a full-size Bosch washer and dryer expand functionality. The guest bedroom offers complete privacy on the other side of the apartment as well as its own marble bath and walk-in closet. The unit conveys with two tandem parking spaces in the building's garage. An Exquisite Condominium Served By A World Class Hotel. Waterview is a turn-key luxury offering with a fully staffed front desk, concierge service, modern fitness facility and a resident lounge with large screen TV, free wifi and coffee service. The building's piece-de-resistance is the 31st floor observation deck with the most astounding views of the city and its monuments available anywhere. Access is limited to residents-only. It's an outdoor room where residents enjoy a gas fire pit, 2 outdoor kitchens, lounge and dining areas all under the sun, air and stars. Additional services are provided by the on-site Hotel Le Meridien including an exceptional restaurant, meeting rooms, outdoor lounge and available in-room spa and dining services. Just a stone’s throw from the Metro, Starbucks, restaurants, Key Bridge and Georgetown, GW Parkway and the airports, absolutely nothing compares. A brand new grocery will be just 3 short blocks away. Residents can also walk one block to the Metro, over Key Bridge into Georgetown, onto paths and trails for running and biking. Tons more shops and restaurants await in Rosslyn and nearby Clarendon.